Anyone watching a team of firefighters extinguishing a blaze near Kibbutz Zikim this week would have noticed something odd. 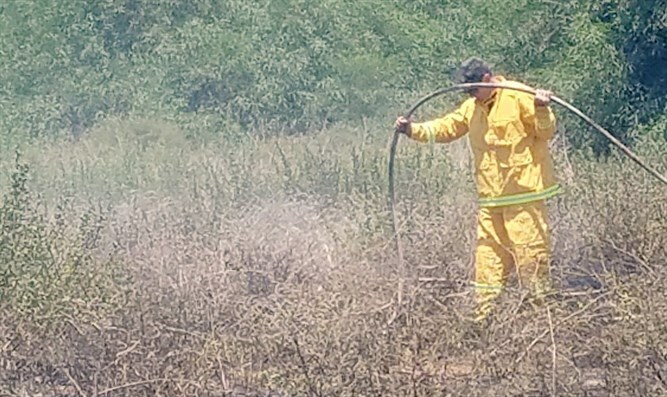 Despite wearing the same uniform and using the same gear as Israel Fire and Rescue Services, many of those working to put out the fire caused by a Gazan incendiary kite were communicating entirely in English. The team of firefighters are not Israeli, but a squad of American firefighters that had flown into Israel specifically to lend a hand in combatting the plague of flaming kites that have devastated Israel's south since the "kite terror" phenomenon began in April. Using kites, balloons, and even birds to carry incendiary devices into Israeli territory, cells of Hamas-aligned terrorists have launched thousands of incendiary attacks on Israeli targets, causing millions of dollars of damage. 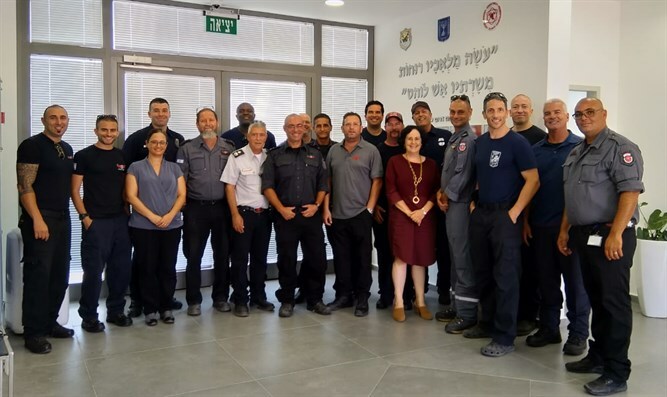 The firefighters are part of the Emergency Volunteers Project (EVP), an organization brings in medical and rescue personnel from all over the world to assist Israel in times of need. Since its founding in 2009, EVP's volunteers have been present at virtually every natural disaster in Israel, ranging from the massive forest fires of 2010 and 2016 to its doctors and nurses assisting at Ashkelon's Barzilai Hospital during Operation Protective Edge. The initial team of ten firefighters first arrived in Israel last week. After undergoing a rudimentary course in order to understand the inner workings of Israel's firefighting establishment, the volunteers were embedded in Israel's Fire and Rescue Service and have been extinguishing the various blazes ever since. Another 40 volunteers are on standby and are ready to arrive if the incendiary kite phenomenon persists. The entire effort is sponsored by the Jewish Federations of North America. EVP's volunteers sleep in firehouses along with their Israeli counterparts when off duty and officials say that long-lasting friendships are common. "Over the course of the deployments and training, many of our volunteers have formed very close bonds and friendships with their Israeli counterparts. For some, this is their second and third time deploying together," says EVP spokesperson Eitan Charnoff. Not all of the volunteers are Jewish. Many of them have no obviously tangible connection to Israel other than there sense of connection to the country and their desire to help out. "This is exactly what EVP was founded for, to bring the best of America's best and other rescue services to Israel to show solidarity and support to their Israeli brothers," said EVP CEO Adi Zahavi. "Every time we deploy our teams whether it be medical, fire, or others, I am reminded that we are not alone."